While South Africa’s financial stocks are breaking all kinds of records, another of the country’s stocks is not performing at all as well – the blood stocks. 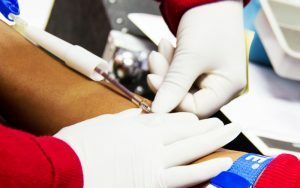 Blood supply in South Africa is at just 1.8 days of Group O stock, equating to less than 2 000 units, and donors are urgently needed to come forward, the South African National Blood Service (SANBS) announced today. “The blood stock in the country is dangerously low. The blood supply is currently at just 1.8 Group O stock, compared with a healthy blood stock of 5 000 units or five days’ stock,” says Silungile Mlambo, national marketing manager for the SANBS. The decline of blood available countrywide follows that of a drop in KwaZulu-Natal this week. KwaZulu-Natal had just 1.8 days of stock available on Wednesday, equating to fewer than 200 units – leading to the SANBS issuing an appeal for donors in the province. A healthy blood stock in KwaZulu-Natal is 500 units of O blood a day. “Unfortunately, the rest of South Africa finds itself in almost the same position as KwaZulu-Natal less than 48 hours later, which is why we are calling on all South Africans to go to their local donor centre and donate blood,” says Mlambo. Mlambo says blood is critical for cancer patients and women in childbirth – who constitute the two big groups of people requiring blood transfusions. “So many people in life-threatening situations require blood. It’s what saves a haemorrhaging mother’s life, so that she can raise and love the baby she has just brought into the world. It’s what saves someone suffering complications during major surgery. It’s what helps cancer patients endure and survive treatment. The SANBS appealed to South Africans to donate blood immediately.